Remote sensing data and GIS techniques have been used to compute runoff and soil erosion in the catchment area along the NH-1A between Udhampur and Kud covering an area of approximately 181 km2. Different thematic layers, for example lithology, a landuse and landcover map, geomorphology, a slope map, and a soil-texture map, were generated from these input data. By use of the US Soil Conservation Service curve number method, estimated runoff potential was classified into five levels—very low, low, moderate, high, and very high. Data integration was performed by use of the weighting rating technique, a conventional qualitative method, to give a runoff potential index value. The runoff potential index values were used to delineate the runoff potential zones, namely low, moderate, high, and very high. Annual spatial soil loss estimation was computed using the Morgan–Morgan–Finney mathematical model in conjunction with remote sensing data and GIS techniques. Greater soil erosion was found to occur in the northwestern part of the catchment area. When average soil loss from the catchment area was calculated it was found that a maximum average soil loss of more than 20 t ha−1 occurred in 31 km2 of the catchment area. 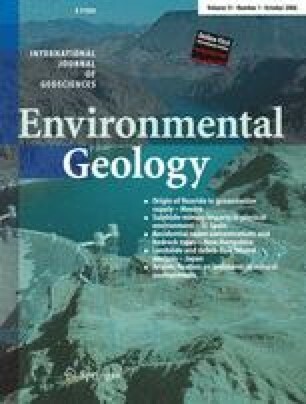 The authors are highly thankful to the Head of the Department of Geology, University of Jammu, Jammu, for providing the facility to carry out this work.